This stunning 12-light Crystal Chandelier only uses the best quality material and workmanship ensuring a beautiful heirloom quality piece. 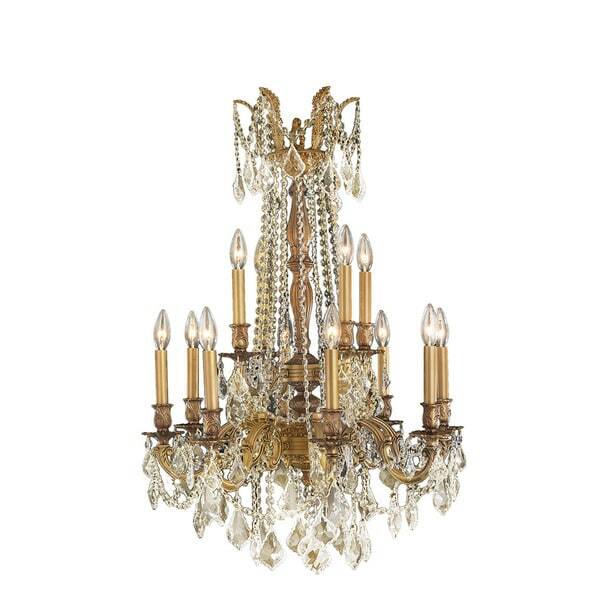 Featuring a radiant french gold finish and finely cut premium grade golden teak colored crystals with a lead content of 30-percent, this elegant chandelier will give any room sparkle and glamour. Warning Attention California residents: This product may contain lead, a chemical known to the State of California to cause cancer and birth defects or other reproductive harm. br< Please Note: Orders of 151 pounds or more will be shipped via Freight carrier and our Oversized Item Delivery/Return policy will apply. Please click here for more information. Dimensions 24.0 In. X 24.0 In. X 36.0 In. its beautiful! and I love that they look like real candles. "The top description says French Gold finish and clear crystals while below the finish is listed as brass and Golden Teak Crystals....Which is correct?" The metal finish is French Gold. and not Brass. The crystal color is Golden Teak. "What is the weight of this chandelier?" "The top descriptions says French Gold Finish and clear crystals (pictures shows clear crystals) but below finish is listed as brass and Golden teak crystals? Which is correct?"